On Great Barrier Island the nurses are the 'keepers of secrets', the witnesses to life, love and death in a small community. "Island Nurses" 2016 is a memoir of over 30 years of caring for generations of residents in a remote, rural island community. ►Gold Edinburgh Expedition to Great Barrier 1972 The route was carefully planned amongst all members of the family and took in courses in navigation, seamanship, boat handling, and Quarter Master duties. ►Kaiaraara Kauri Dam - Three dams were erected from the kauri logs, built across the headwaters of the Kaiaraara Stream, directly below Hirakimata. Part of a printed booklet of 1904 “My Own Story” in which Emile Monson Malcolm describes the sixteen years the family spent on the island from 1854. Stamps and blank stamped flimsies available commemorating the 100th Anniversary of the wreck of the S.S. Wairarapa issued by Great Barrier Pigeon Gram Co.
►Riding to school on Great Barrier Island Lesley Rockell (then Lesley Mabey) rode to and from school in the 1940s and 1950s on Great Barrier Island. 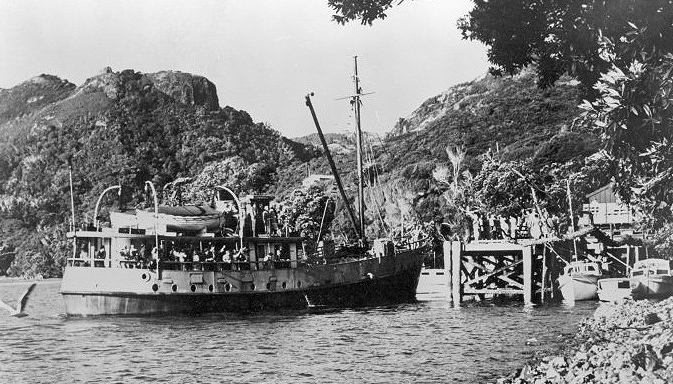 ►SS Wairarapa Graves with a partial list of 250 passengers and crew. After 20 minutes of ear-crushing roar from two engines just a few metres from our heads, the silence on the ground at the Claris airstrip is just as deafening. A faint breeze rustles the grasses and flax choking the swamp around the green airstrip, but otherwise there is no sound. Four-hat double act Great Barrier Island's two person police force, firefighters, volunteer ambulance drivers and skippers for the local coastguard. And the 2013 big scrubbie that took out about 115 hectares. Me & My Garden: Sue Daly's productive straw bale vege patch on Great Barrier Island. Although on remote and sparsely populated island in the Hauraki Gulf, there were no straw bales to be had for love nor money, so Daly used bales of native reeds. Relax On New Zealand’s Great Barrier Island You know you’re on a remote island when the only pub has a sign that reads, ‘Due to the lack of a bank, change is in short supply. Please use change wherever possible.’ I knew that New Zealand’s Great Barrier Island was going be very different. Les and Bev Blackwells are strictly organic gardeners and the Barrier's isolation means they have to be pretty canny about making the best of what's available. “There’s a feeling of unreality about seeing something like this happen in front of you, when behind you everything is completely normal. Writer Brown Paraone tells of going out hunting with his nephew, local boy Kahurangi Fraider (14) who had entered the Claris Sports Club pig hunting competition. Kahu won the comp with his boar weighing 59 lbs. Community spirit is alive and well on Great Barrier Island, and has brought its women together to disrobe for a worthy cause. The local Playcentre needed a $50,000 renovation, and just like women on another island a Calendar Girls style calendar "Barrier Unhooked" was born. Despite how isolated it is this newly opened sustainability-focused cafe continues to flourish, thanks to the locals, writes Kathy Cummings. Jennifer Beck’s account of her memorable visit to Great Barrier Island written in 2004. Pat's Story; Les and Beverley's Story. Great Barrier Island -Circumnavigation NZ Kayak Magazine 2007. Kayaking around Great Barrier the week before Christmas – what better way to avoid the rush. Protection of the island's natural character with QEII open space covenants. NZ House & Garden 2006. Sue Hoffart meets a Great Barrier resident who has made the most of the island's special magic, former Auckland city-dweller Judy Gilbert. Last, loneliest, loveliest, Great Barrier Island is a mystical, mythical place, the last big land mass between Auckland and the vast Pacific. NZ House & Garden On Holiday Summer 2004. Source: National Library of New Zealand (Alexander Turnbull Library). 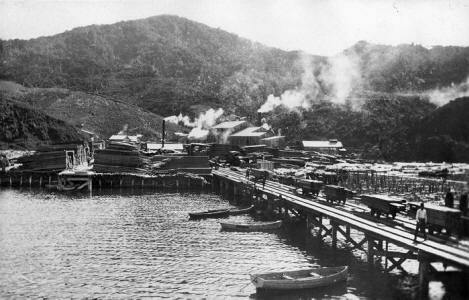 A sawmill and wharf structures at Whangaparapara, Great Barrier Island, New Zealand, ca 1910.